Sign up for The Scientist's daily e-mail. The 2002 Nobel Prize for Chemistry was awarded yesterday (December 10) in Stockholm amid protests that two of the biggest contributors to the field of mass spectrometry in protein chemistry had been overlooked in favour of a researcher whose system is rarely used. Koichi Tanaka of the Shimadzu Corp in Kyoto, Japan shared half the prize with John Fenn of the Virginia Commonwealth University, Richmond, USA, "for their development of soft desorption ionization methods for mass spectrophotometric analyses of biological macromolecules." In 1988 Tanaka designed a system in which freely hovering ions are generated from biomolecules in a solid or viscous sample. These are then set in motion and the time they take to hit a detector noted. The molecular weight of a protein can then be measured by analysing the ions' charge and speed. Along with Fenn's system called electrospray ionisation, which generates hovering ions from an aqueous solution, the two approaches are considered by the Nobel Prize Committee for Chemistry to have opened the way for mass spectrometry to be applied to large biomolecules — thus revolutionizing protein chemistry. Previously, it could be applied only to relatively small molecules. However, Peter Roepstorff, a protein chemist at the University of Southern Denmark in Odense declined his invitation to the awards ceremony because he felt that Tanaka's portion of the prize had been "sent to the wrong address." More deserving winners, in his opinion, would have been Franz Hillenkamp of the Institute for Medical Physics and Biophysics at the University of Münster, Germany and his collaborator Michael Karas of the Institute for Physical and Theoretical Chemistry at the University of Frankfurt. Hillenkamp, Karas and Tanaka are jointly credited with having introduced matrix-assisted laser desorption/ionization (MALDI) to mass spectrometry in 1987, but it was the German team who showed that by embedding the sample in a matrix that absorbed radiation at the wavelength of the laser, they could achieve much better ionization. 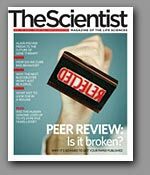 "In a strict sense, Tanaka was probably the first to send large molecules into the gas phase using a laser shot, but his method did not work very well," says Matthias Mann of the Protein Interaction Laboratory, also at the University of Southern Denmark, who agrees that Hillenkamp and Karas made a more important discovery. "I do not know any protein study that has been based on the Tanaka method," adds Roepstorff, "But I can tell you about thousands based on the Hillenkamp–Karas principle." "I was surprised Hillenkamp was not there in the Nobel Prize," concurs Joel Vandekerckhove, a protein chemist at the University of Ghent, Belgium. "He was, to me, the person who appeared most in the MALDI literature originally." The chairman of the Nobel Prize Committee for Chemistry, Bengt Norden, told the Swedish newspaper Dagens Nyheter that Tanaka was being honoured as the first to develop an idea that changed other people's way of thinking. The remaining half of the prize was awarded to Kurt Wüthrich of the Swiss Federal Institute of Technology, Zurich, and the Scripps Institute, La Jolla, California, for his work with nuclear magnetic resonance spectroscopy. D. Bruce, "The Nobel Prize for Chemistry 2002," The Scientist, October 9, 2002.